Why Should I Care About the Situation in the Ukraine? Home Editorials Why Should I Care About the Situation in the Ukraine? Why should I care about the situation in the Ukraine? Good question! Glad you asked. Although the Ukraine used to be under the control of Russia, the rather internally divided multi-ethnic country broke away and achieved its tenuous independence in 1990. Since that time there have been 5 president (including today’s interim president Oleksandr Turchynov), and 15 Prime Ministers (including today’s incumbent Arseniy Yatsenyuk). While a treaty (“The Budapest Memorandum”) signed in 1994 by the US and Britain has a remote chance of pulling the UK and the US into the regional ongoing conflict of the Ukraine, it is doubtful that things would escalate that far without a direct assault on the U.K. or the U.S. The EU has relied upon 25% of its oil and natural gas coming through the Ukraine — so in many ways it has wanted to tread lightly in that country and has been working towards pulling it into the EU as a partner with many incentives by the IMF which has offered financial assistance in the face of mounting economic woes. Without that oil and gas, Europe will suffer. The problem is, however, the same is true for Russia. If the Ukraine becomes allied with the EU then Russia would become a paying importer of oil rather than an exporter. In addition, the Ukraine is a virtual breadbasket for Russia — with fertile farm lands producing much needed food supplies. On top of that is the involvement of the international banking cartel (IMF/BIS) and groups working with the CIA to stir up anti-Russian sentiments in the Ukraine and bolster support for the globalists of the E.U. From 2005 to 2010 Viktor Yushchenko was Ukraine’s pro-EU President who in 1993 was appointed Chairman of the National Bank of Ukraine (Ukraine’s central bank), which pleased the globalist central bankers. Pro Russian Viktor Yanukovych replaced Yushchenko, and he recently rejected a bid by the EU’s IMF to help bail out the country’s flagging economy in favor of a Russian bailout. This pleased Russia, but Yushchenko’s corruption and theft of government money helped sway public opinion against him — assisted by CIA operatives help to stir up anti-Russian sentiments. Over the last week he appears to have fled the country and has been replaced by an interim “president”. The current interim president is Oleksandr Turchynov, another pro-European pawn in this lethal game of regional chess. The new prime minister of the Ukraine is millionaire and former banker Arseniy Yatsenyuk who is all but in the hip pocket of the IMF and the Central Bankers. So both of the men in charge are pro-European stooges of the Western globalists and that connection is a perceived and likely very real threat to Russia’s interests. Rumors of neo-Nazi affiliations are spreading and may likely be true. Another Russian interest in the Ukraine is the very strategic Russian naval base in Crimea — a peninsula of the Ukraine in the Black Sea. Anything or anyone who might threaten access to the services rendered by that port would be viewed by Russia as a very real threat! The CIA, and related pro-Western covert forces, have very much been meddling in the Ukraine to stir up anti-Russian sentiments in those areas not so heavily dominated by a Russian populace. Russia, of course, is not taking this lying down and has sent in troops and stationed more along the borders. But it is more than even that. Russia and China both have different ideas from the Western powers about what constitutes the best globalist vision of a New World Order. Russia and China both believe they should be free to either reign supreme or at least be equal yet independent partners in this Brave New World Order. They really don’t like the idea of yet another form of UN, G20, G8 or even G6 form of global governance, or of being subservient or accountable to anyone else. The Bible presents a similar picture of the Western EU powers allied with the coming antichrist, having opposition both from a power from far the North (Russia), and a very sizable group allied with the Rulers of the East (China — said to have a standing army of at least 200,000,000 soldiers — which was achieved and exceeded by China many years ago). Don’t be surprised if all of this further alienates Russia from the Western powers and becomes yet another bone of contention. Also, do not be surprised if it results in a civil war that bleeds into the EU itself — and into other countries via terrorist activities from any and all sides. War and conflicts and chaos, I must remind you, are a great way to rally the people of every faction to their particular causes and it takes our eyes off who the real criminals are in all of this. Conflicts such as this are a great money making deal for the corporate war machines and investors of both sides of the conflict, it is also a distraction of the masses from all the other ills we face, and it furthers the neo-eugenic program of the Å±ber elite to eliminate more “useless eaters”. A win-win situation for those who have globalist goals of managing the ignorant masses. Big oil and big money during harsh winters and fragile economies can bring about surprising things. Sabotage seems a popular way to make a point. Economic sanctions have ways of blowing up — sometimes literally. Political divides and animosities generally increase as do socio-economic problems and ethnic violence. Interconnected economies are perhaps at their most fragile stage right now. A downturn in any area could have a cascading effect — and the same is true of random terrorist or para-military actions or state military actions. And, the return of the cold-war era is always a threat — with Russian vessels already off our coast and docked in Cuba. The economic and political landscape hinted at in the Bible is one where America is not even mentioned (for whatever reason), Russia and China somewhat oppose the European globalists, and hostilities in the Middle East escalate. In a world of extremists and globally interconnected volatile/fragile economies with multiple flash points, the events of Crimea and Ukraine become just another trigger for continued global unrest and suffering. Historically, whenever economies take a serious downturn, unrest conflict and war magically seem to follow. There are many powerful people/corporations/movements who love to meddle and take advantage of such times. A global economic reset/”correction”/collapse is inevitable, so political and civil unrest and regional unrest cannot be far behind. The “big boys” behind the scenes are already licking their chops — they smell blood in the water and can almost taste the sweet success of bringing their New World Order out of the ensuing chaos. Argentina, Venezuela, Greece, Cyprus, Libya, Egypt, Syria, Iraq, Afghanistan (etc.) have merely been trial runs for what is ahead. In the States it has been even easier for them, no real violence or public protests to worry with — even with their trial run of a complete military shut down (imposition of martial law) in Boston, with door to door searches for just 2 handpicked stooges. What happens to America in the interim is anybody’s guess. · A retreat to protectionism and disengagement from being the world’s policeman? · Economic collapse and civil war and martial law? · Major terrorist attacks (foreign or domestic) on nuclear facilities or power grids? · Major catastrophes like an EMP, or pandemic, or earthquakes, volcanic eruption (as may be the case in Yellowstone)? Your guess is as good as mine, but I suspect a combination of the above could turn us into a banana republic almost overnight. We seem to have been headed in that direction for some time now. So, will there be any US military involvement in the Ukraine? … Mmmmm, I doubt it. Maybe an ineffectual presence of NATO or UN troops in the region, and much empty rhetoric and sword rattling, and the drawing meaningless lines in the sand, but actual intervention? I truly doubt it. I think we’re saving up all that conflict for the coup de grÃ¢ce of a Middle Eastern Armageddon — probably less than a decade down the road. Between now and then, don’t forget to start stocking up on food and water and necessary supplies, just in case things start unraveling much sooner than most people think. Too many triggers are in the hands of too many sociopaths to think we live in a safe or sane world — we don’t. 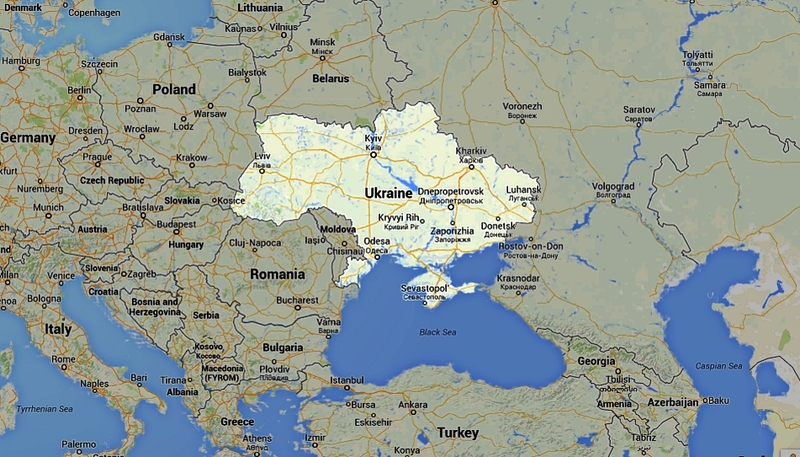 Should we care what is happening in the Ukraine? Absolutely! What happens there will have a profound impact of US/EU/Soviet relations — and the chaos there can have dire ripple effects across the board. Don’t think we are immune from the fall out here in the U.S. — we’re not immune at all. 9-11 should have proven that to you, and it looks like chaos and uncertainties and instability will become the new norm for a while — at least until the powers that be divide up their realms and prepare for the coming Armageddon. Even so, come Lord Jesus. Stay alert, informed, prepared, and safe. P.S. A variety of news reports and commentaries have been used to piece this little report together. My apologies for not footnoting anything, but I’m sure you can find the sources and quotes with a few quick searches (just like I did). Views expressed here are solely my own and I’ve done my best to vet the sources of this info to the best of my ability.